bl.uk > Online Gallery Home	> Online exhibitions	> Asia, Pacific and Africa Collections	> Dubrajpur rocks, Beerbhum. 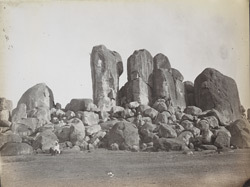 This photograph was taken by an unknown photographer in the 1870s and forms part of the Temple Collection. The rocks are situated south of the village of Dubrajpur in the Birbhum District, Bengal. They are huge picturesque outcrops of granite and gneiss (composed of glassy quartz, pink and grey feldspar and black mica) which cover an area of a square mile. In the centre is a block of granite 60 feet in height united to a mass of gneiss which adheres to it at an angle of 45 degrees. The summit commands a fine view of the surrounding countryside as far as Parasnath and the Rajmahal and Panchet Hills.